Over the weekend of 21/22 September 2013 I took my place inside a yurt as part of the Art Root event. 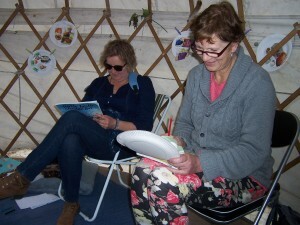 We had a lot of fun writing poems on paper plates etc. I decorated the yurt with materials I had previously used during poetry workshops with P1-P5 in schools as part of the Curriculum for Excellence. I was delighted Ute Penny wrote her first poem here, and brought her friend Elinor along too.